It’s always exciting to find a band that completely embodies their sound in stage presence and persona with on point fashion and dance moves to match. 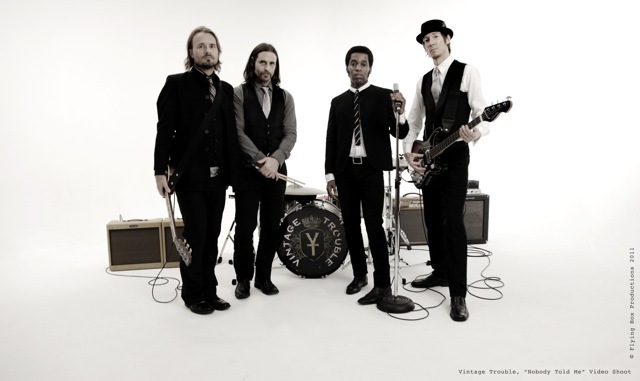 Meet Vintage Trouble, the retro rock and soul quartet from Los Angeles that got their start playing small local venues and late night speakeasies just two years ago. Today, they are supporting one of the most influential bands in rock and roll history, The Who, on their first North American tour in nearly 4 years. Playing songs from their debut album The Bomb Shelter Sessions (2011) which was recorded using techniques to emulate the sounds of vinyl from the days when soul music reined, this group of talented and experienced musical artists has found extreme success as a live show and as recording artists. Vintage Trouble’s unique representation of old school R&B meets new age funk has been spreading like wildfire and there are no plans to slow down anytime soon. If you’re in the Los Angeles area for New Years looking for a memorable dance party, check them out at The Roxy and embark upon the musical journey of Vintage Trouble. Or live on Later… with Jools Holland (London). After this performance, Vintage Trouble was the sixth most tweeted topic in the world.